A somewhat brief report for today as the gang was a bit thin in numbers due to meetings and training courses. The main effort was in the children's play area at Toddington. The new furniture has arrived and C&M have been asked by the Friends of Toddington do the hard work excavating holes for this furniture. Rod came along to offer advice on using the mechanical auger which Phil then operated. There was a lot of discussion regarding the position of the new slide since as, as first positioned, we felt we would damage the new sewer pipe. So a couple of test holes later the slide was resited. 9 no 6" diameter holes were required but following equipment failure and the sleet we only managed 3. The other 4 holes were approx 2ft square and nearly 2ft deep. We used the auger to loosen up the clay which sticks to everything. Again for the same reasons we managed to complete 2 holes and got about halfway down the remaining 2 before being sleeted off. At Winchcombe in the workshop one of the benches was having its planks repainted. Also at Winchcombe in the workshop the bench in question had its scripted bench ends repainted into chocolate and cream. Due to the absence of the principal photographer Jim the next report on the C&M blog will be at the beginning of May. There's a whiff in the air - no more. A mixed bag of activities this time, with several items being addressed at once. At Winchcombe in the workshop Ian and Bruce were working on refurbishing one of the Winchcombe benches. All the other work took place at Toddington though. Here chief painter Mike R completed brushing in the kiln dried sand into the gaps where the slabs had been re-laid on P1. While he was doing that Jim H finished inserting pea gravel in the gap alongside the new Pod footpath. Unfortunately there are no photos of either activity, the chaps were too busy working. Barrie, Pete and Martyn removed all the temporary tarpaulins and associated materials, scaffold boards and Heras fence feet from the roof of the admin block. Then Barrie Martyn and Jim H set about gluing and nailing new roofing felt on the top, to make a better and more permanent repair. Barrie went round the edges screwing on the securing battens. Another job off the list. With the roofing felt on, the admin office looked presentable again. These Portacabins are getting to the end of their life, and in due course their functions will be transferred to the new office block we are buying in the yard at Winchcombe. That should happen later this year. Mike, Jim M & Phil fishing for the plastic bag. Phil, Jim M, Mike and Pete did a thorough rod and flushing exercise on the new sewer pipes where a bit of a whiff had been detected. They discovered a plastic bag left in by the contractors, which we think accounted for the backing up of the sewer material. Phil flushing the main sewer pipe. Pod sewer pipe supports completed. Just to be sure there are no more smells the new manhole we had to put in has been well and truly sealed in concrete. Finally improvements were made to the supports for the new sewer pipe connecting all the new Pods. So not a very exciting day, but one which hopefully has finally sorted out both the smells and the leaking roof. A big discussion about an old engine. Finally C&M were asked to assist the Friends of Toddington in moving the old engine in the children's play area. However after some discussion it was decided that this was too far gone and it will be dismantled with possibly just the noughts and crosses being retained. During the day new furniture was delivered, so watch this space to see how that works out. The noughts & crosses board. The little wooden engine now waits in the playground for its fate. Anyone see the similarity between it and the little Ruston 4 wheeled shunter? 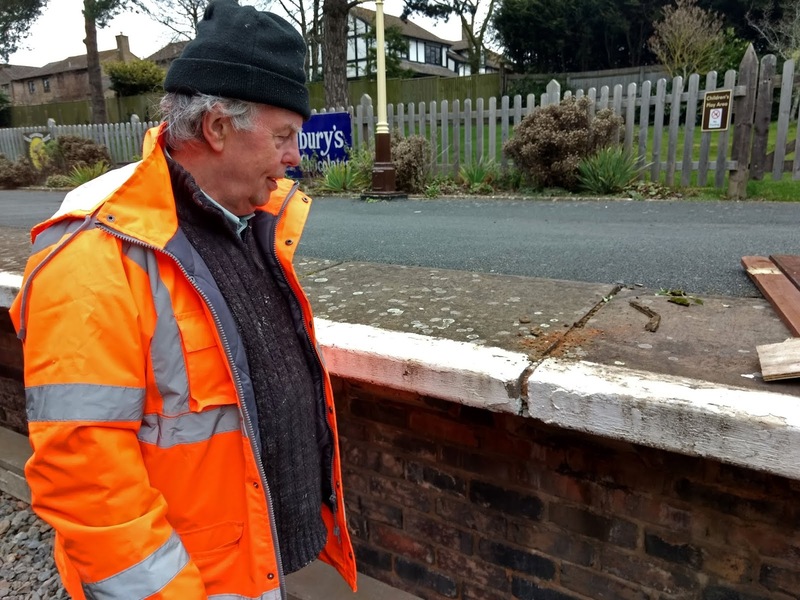 Where the recently relaid slabs met the tarmac at Toddington on P1 a small gap was detected between the tarmac and the platform copers. Roger and Jim H bridged that gap with a small supply of tarmac that they heated with a gas torch. It's only a small job, but it will stop anyone tripping and falling over the edge. It's not unheard of! Preparing to completely reset the third slab - John, Pete and Jim. Then on to Winchcombe, where there has been some movement in the last 3 slabs on P2. These had to be reset. This involved John cutting a small slot in the tarmac to allow the slabs to be pushed back into position and re grouted. The last slab had to be completely taken off and reset. Mike rolling out the lining strip. The rest of the day was taken up with investigating a nasty smell near the new pods, more clearing up after our activities at Toddington and making 2 deliveries to Broadway. This set them up to start slab laying under the P1 footbridge steps, in readiness for the arrival of the scaffolding to do the roof. Several jobs were finished on Wednesday. In a magnificent solo effort, Mike has completed the painting of the Flag & Whistle on the car park side. It looks like new now. At Winchcombe behind the workshop the new white Transit was fitted with a secure tool box, as well as a green wheelie bin for the transport of shovels and similar tools. Also at Winchcombe, Barrie, John and Phil fitted a new and very heavy work surface in the booking office. Mike and Phil then completed the white line on platform 2 at Winchcombe, just in time for the first trains this season. Pete and John went to CRC to fill in holes in the tarmac, but that was far away, while the photographer was at Toddington. Well, you can't be everywhere at once. At Toddington Jim H and Jim G fitted the barge board to the bottom of the new fence by the new pods. This job can now be declared finished, again ready for the new season. The two Jims then ran a clear up service, taking spare materials and some rubbish away from the Toddington site to Broadway and Winchcombe. The tail lift on the Transit was particularly useful here. And finally, we are pleased to announce that the slab relay on the Toddington platform is now completed. That's another job off the list by the C&M gang. Here Bob and Terry lay one of the last slabs using the vacuum 'sucker'. What a marvelous machine it is. The area around the drain at the north end of the station building was the last bit to be finished. Now there's just a bit of a clean up needed, and some sand to go in the gaps. Above you can see the complete relay of all the slabbing, under the canopy and by the entrance gate at the north end. It's a fine job done, very neat and level. Finally, here is the proud slabbing gang, except for Mike, who was at Broadway. Paul, Clive, Rod, Bob, Keith and Terry. Paul's usual cup of coffee must be in his left hand, we can't see it? Your valiant reporter was out in the company Transit most of the day, so photo opportunities were limited, unless you like pictures of Transits in front of various buildings. An essential but non-productive trip was made to Evesham to get the tail lift tested. This comes under the "Lifting Operations and Lifting Equipment Regulations" 1998 (LOLER) for short. 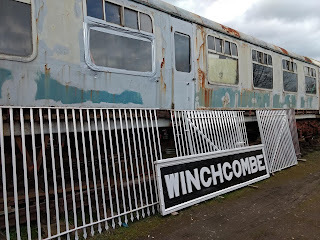 A work surface for Winchcombe was then collected with the same Transit from B & Q, and delivered back to Winchcombe. It turned out to be the wrong size, so another journey back to Evesham to return it to B&Q. On then to Winchcombe, to collect some slabs for Toddington. Then on to Broadway to collect more paving slabs, which were also delivered to Toddington. 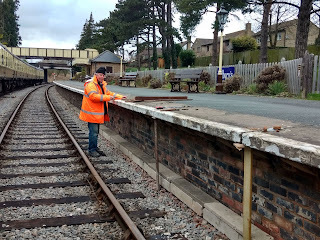 While the Transit was shuttling about Jim M and Mike R were applying more white lining along platform 2 at Winchombe. They got about half done. During the day Mike G was working in the cafe at Broadway where he fitted a new tap in the kitchen. Catching some rays at lunch time. A sneaky look at P2 at Winchcombe during the day found the running in board duo Ian and Bruce enjoying the sunshine on this brilliantly sunny day, when the February thermometer hit 17 degrees C.
Pete and Phil completed the steps for the Pods and did some remedial plumbing for them as well. The re-slabbing team from Broadway was in full action again by the station building in Toddington. You can see that it's quite tricky to get the new slabs laid to fit, and a lot of cutting was required to get each one exactly the right size. This was all done 100 yards away in the car park, to keep the dust away from the building and the other members of the gang. It's also worth mentioning how neatly the slab team have managed to lay the slabs level with the concrete cable duct which runs across the area they are working on. Two main teams today, with a couple of extras. 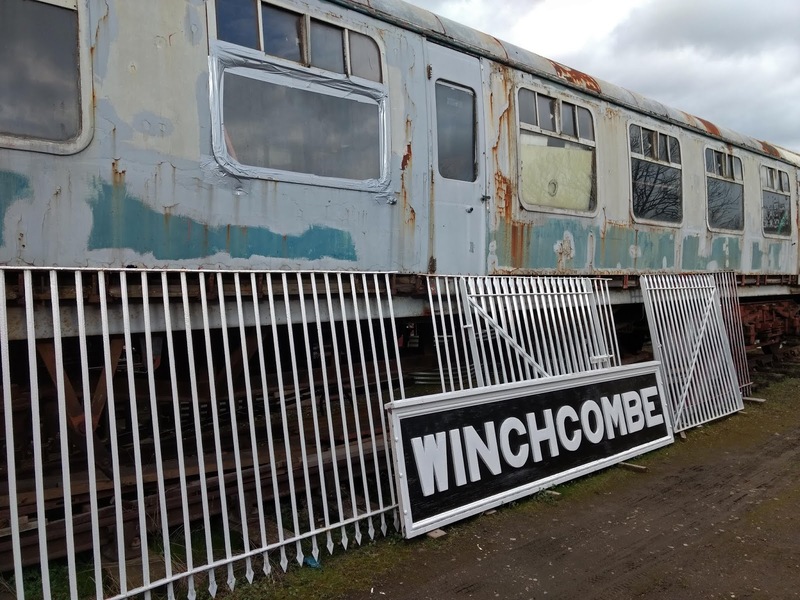 The Winchcombe team was busy with the renewed running in board for platform two. During the day they erected the renewed running in board, and you can see it here back on its two cast iron posts with original GWR finials. P1 needs two more cast iron finials... if you have any spare ones in your garage, get in touch. The same team then moved on to Toddington. Austen and Jim at work in the background. At Toddington by the new pods they laid 4 foundations which will each have a step on top for the 4 doorways. After the foundations were cast one step was completed and another had the brick base built - see before and after pictures. Along P1 at Winchcombe the white line started last week with the heat treatment was completed. Before the line can be painted along the edge of P2, the wide joints between the slabs need cleaning and repointing. That was John's job today, and it was a pretty long one too. The joints were wide and filled with soft mortar and a few weeds. Bit by bit John scraped this out and filled again with new. With a smooth surface along the edge, the white line can then be applied successfully. It won't stick if there are voids. The relaying of the P12 slabs at Toddington continued today, by members of the Broadway team. In the above picture they are cutting and laying slabs at the north end. At the end of the day they were working near the bottom of the footbridge steps. A lot of care had to be taken to set levels appropriate for the cable troughs that run underneath. There was a lot of cutting required too, for the fiddly bits around the steps. The cutting of the slabs took place off site, some distance away, in view of the dust being generated. Note all the safety gear in use, no luxury here. Finally the southern end of the platform, recently completed, was power washed for that nice clean finish. Walk on that nice clean finish? You must be joking !